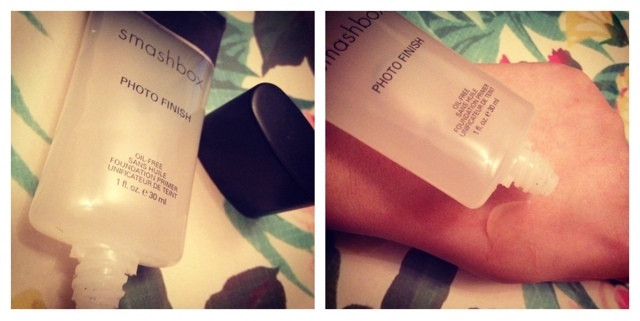 Smashbox Photo Finish Primer is my personal Holy Grail of Foundation Primer. Until around about September time, I never actually realised the benefits of priming before your foundation. I always thought that Moisturising was enough but I would become frustrated 5 hours into the day or when my make up would begin to look either greasy or dry. Especially on days that I wasn't quite feeling myself, you know the days when your make up just doesn't look right? I started reading blogs a little while before starting one myself and the subject of foundation priming would crop up all over the place, I spoke with my mum and sister who also just moisturised but didn't really know to use a primer first. My first primer actually came in my first Glossy Box subscription which was the Collection 2000 version, this one was alright, I felt it made my face feel a wee bit greasy so I stopped using it. I wasn't really seeing a lot of benefit and nearly reverted back to only moisturiser. I go into town nearly every Thursday night - up here in Aberdeen it is the only night that does 'late night shopping' we are still in the Twilight Zone none of this shopping till 10pm unfortunately (actually that's a lie now, as the new shopping mall is open till 8 daily now, however, It isn't my favourite shopping centre mine is only open till 8 once a week). Anyway, to cut a really long story short, i'm almost always in Boots for my make up - I like to collect my points and object to not buying from Boots if I don't have to. Well, in October Smashbox opened a counter and I was so excited - something different. I got into a discussion with the beauty assistant about primers and she recommended Photo Finish to me (there were a few different types of primer for different skin types), I decided to give it a whirl. Instantly after trying this, I fell for it. It is a clear gel type liquid (if that is even a thing lol) and I use it religiously after moisturising now, it feels ultra smooth on application and it doesn't have a scent. I then apply my foundation on top. What a difference this makes to the look of my skin when the foundation is on, I can honestly say that I hardly ever think my foundation looks terrible now, it is that great. It definitely extends the wear of my makeup. Some days if i'm in a hurry I may forget to put this on, it isn't until after the foundation is applied that I think 'oh crud'. It is those days that I don't like my make up, perhaps it is psychological because I forgot the primer but I doubt it. I believe they have a new one out which is similar - Photo Finish Dark Spot Correcting. I bought the full size 30mls for £25 in Boots, but what the sneaky minx - beauty assistant failed to mention was I could actually buy a travel size version for 12mls at £12.50 which I think is a good price as it lasts ages and you only need a pea sized amount - why pay £25 each to their own I suppose. This is the reason that Smashbox Photo Finish is my holy grail of primers - What is yours? I think I used this primer in the past but I remember it being an opaque white colour, it may have been the 'Light' version. Anyway, I only had a small sample of it but it lasted ages AND it's by far the best primer I've ever used. I use Avon Magix as my primer because I like an extra layer of SPF. I've started using a sample of the Nivea primer (sachet with a mag) and I love it, it moisturises AND primes :D YAY! I love Smash box its one of my favorites I like Tarte Clean Slate poreless primer too its awesome.